Students from River Valley High School attended the Pigeon Forge Leadership Summit in Tennessee last month. Pictured from left: Katie Sloan, Robbie Schuhl, Sharla Moody, Britni Hash, Kaylee Schultz, Ethan Browning, and Ian Eblin. 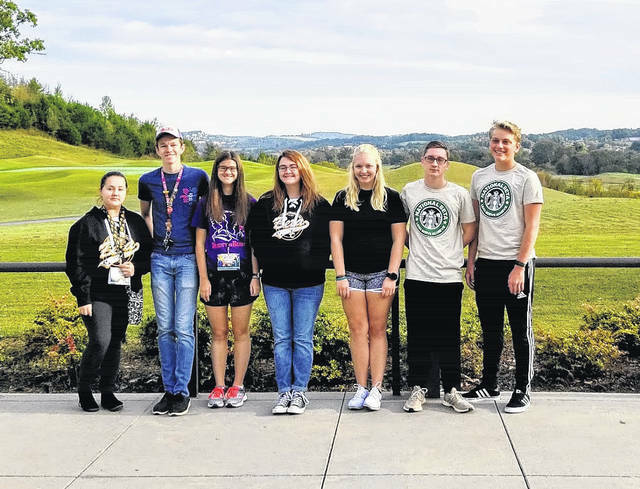 SEVIERVILLE, Tenn. — Seven students from the River Valley High School Beta program travelled south to Sevierville Tennessee last month for the Beta Student Leadership Summit. Students who went learned leadership skills to bring back to their school and make a difference in their community. “We learned teamwork and communications skills, which is really helpful,” said Sharla Moody, vice president of RVHS Beta. Students were given hypothetical scenarios to work through as a team to develop problem solving skills. Part of the activities students were given to do was learning to communicate effectively with total strangers towards a goal. Students would be grouped up according to who they did not know, and were given challenges to work through together. Collaboration was a major emphasis throughout the summit. According to Amy Stanley, advisor for Beta, the program had a lot of emphasis on its core tenants. “They have been really focusing on the four C’s for leadership: collaboration, creativity, communication, and critical thinking. Those are the things that they want the leadership to work on.” stated Stanley. While there for the Summit, Ian Eblin was selected to be a Leadership Representative from the Pigeon Forge Summit to the National Conference. Part of the selection process included writing an essay beforehand and going through exercises with strangers at the summit to develop and display collaboration and leadership skills. Present for the summit were Beta President Kaylee Schultz, Ian Eblin, Ethan Browning, Britni Hash, Katie Sloan, Vice President Sharla Moody, Robbie Schuhl, and advisor Amy Stanley. Reach Morgan McKinniss at 7410-446-2342 ext 2108.